Cold brew coffee is my dirty little morning secret: It’s easy, it’s strong, it’s versatile, and it’s a whole lot smoother and less acidic than hot brewing methods. In short, served hot or cold, it makes a damn fine cup of joe with no fancy equipment needed. (Plus, cold brew concentrate is way, way stronger than regular coffee.) Intrigued? Give it a try! This recipe will make about 2 cups of coffee concentrate, which, depending on how strong you like your coffee, will be enough for 2 to 4 drinks. 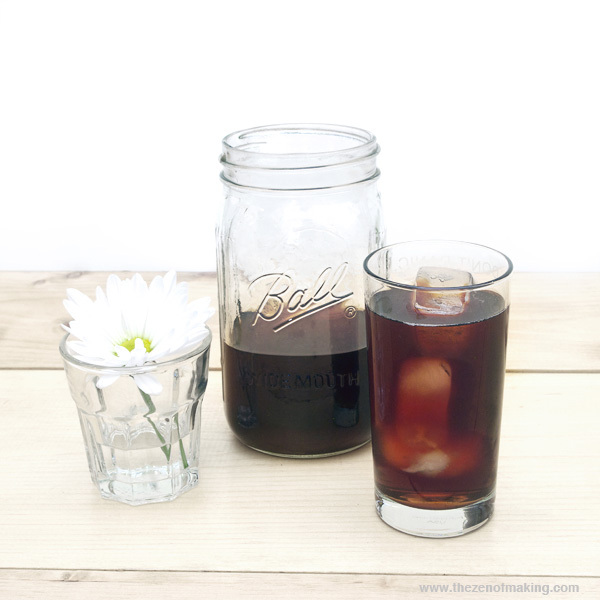 Now, before we get started, I should mention that, like many recipes of this sort, there are a whole lot of right ways to make cold brew coffee. This method happens to work wonderfully for me (and for many of my pals), but it certainly isn’t the only way to get the job done. The key ingredients here are time, coffee, and water, so feel free to play around until you find what works best for you.  Update – A note on coffee grinding: For this recipe, the coffee grounds should be slightly coarser than you’d usually get in a standard package of pre-ground coffee beans. It should not, however, have a chunky or gravely appearance. If you’re grinding your own coffee, stop grinding just as the texture of the beans becomes smooth and uniform. 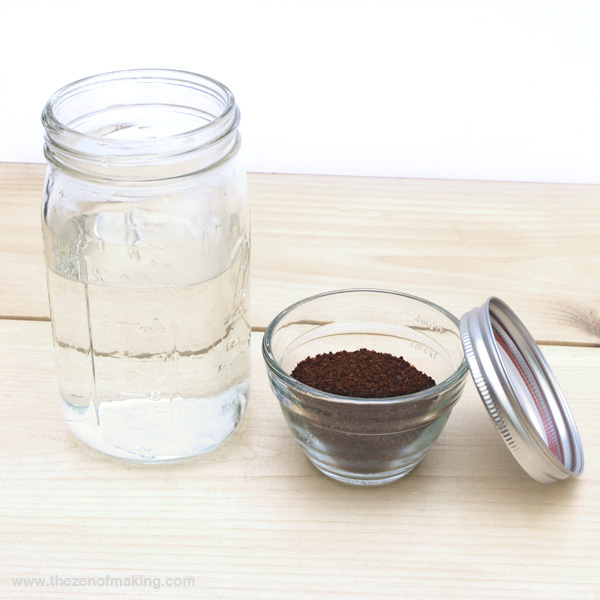 Pour 2½ cups of water into the first mason jar, adding the ground coffee on top. Once the coffee has brewed overnight, it will need to be filtered to separate the coffee concentrate from the grounds. 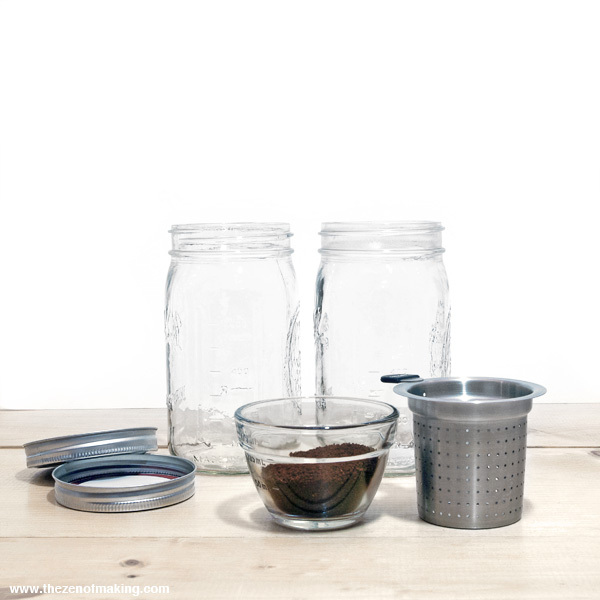 To ready your filter, rest the tea diffuser on the mouth of the second mason jar, then place a coffee filter inside the infuser. To avoid tearing, make sure that the bottom of the coffee filter is pressed firmly against the bottom of the tea diffuser. 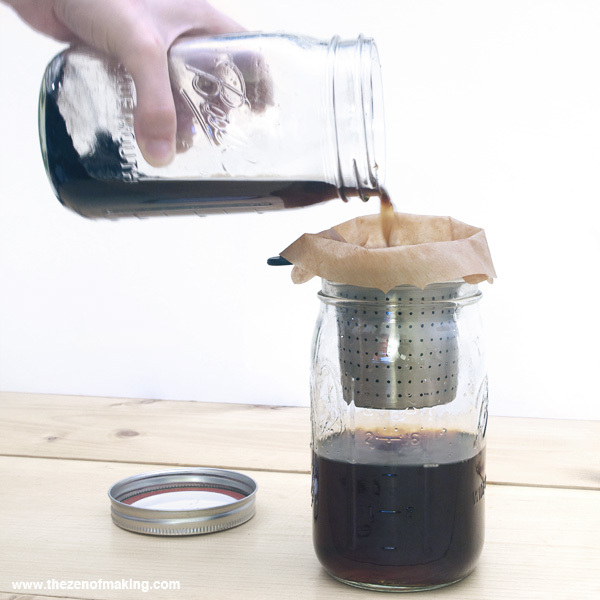 Slowly pour the brewed coffee concentrate through the filter and into the second mason jar, discarding the grounds when all of the liquid has been transferred to the second jar. 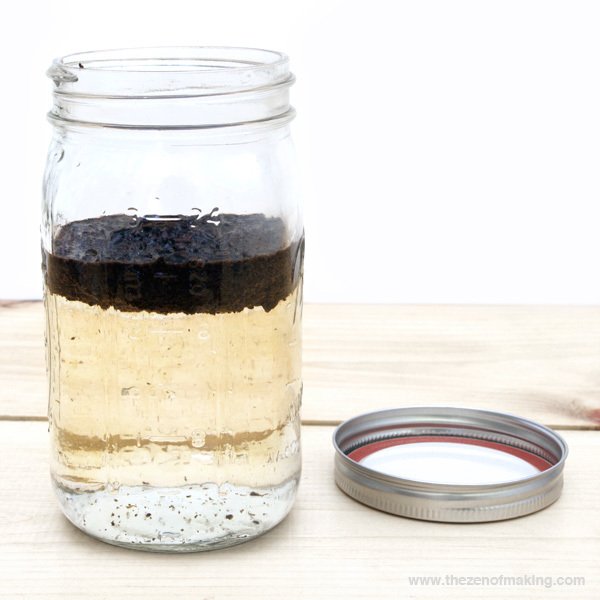 Tip: I quickly wash the first mason jar and the tea infuser each morning right after I filter my concentrate, which means that they’re always clean and ready when I prepare my cold brew before bed. If you ask me, there’s nothing worse than having to do dishes when you’d rather be sleeping! Dilute the coffee concentrate as desired with water or your favorite milk beverage, then add sugar or simple syrup as needed. On warm days, I generally mix chilled cold brew with soy milk and simple syrup, sometimes adding a touch of vanilla extract. When it gets cooler, I heat up my soy milk and cold brew on the stove, then I pour the mixture into a mug with a few chocolate chips in the bottom. 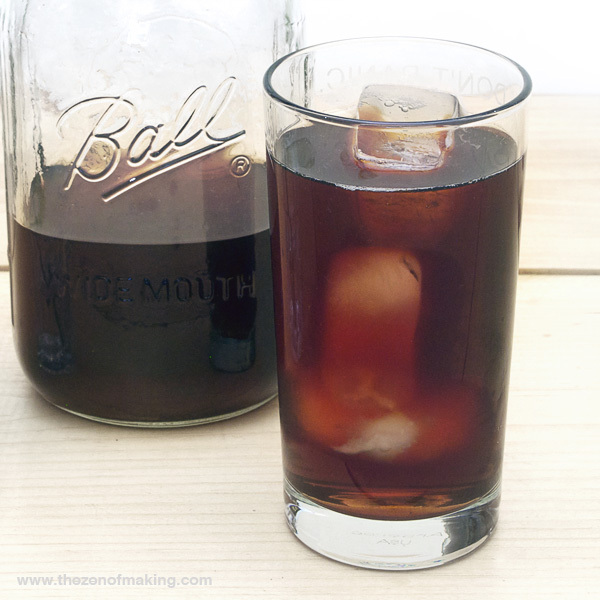 Diluting your cold brew: If you’ve never tried cold brew coffee before, be warned that the coffee concentrate in this recipe is quite strong, especially if you’re using a longer brew time. Even if you’re a heavy coffee drinker, I’d recommend starting with a 1:1 or 2:1 ratio of coffee concentrate to water/milk, then adjusting the ratio from there until you reach the right strength for you. (My ratios are just a guideline. To make sure that you don’t dilute too much, you can always take a sip of the undiluted coffee, then add water/milk from there.) I can tell you from experience—namely, an ill-fated 4pm coffee break that turned into a sleepless night of watching Law & Order reruns—that this cold brew ain’t messin’ around. Update for lovers of strong coffee: If you like your brew dark and strong, you can go ahead and disregard my warnings above. To get the strongest brew, see my note on grinding the coffee beans in step 1, then allow the coffee to brew for at least 12 to 24 hours. Before diluting, test the coffee out at full strength, then go from there. Want to skip the paper filter next time? Check out this reusable coffee bag tutorial that I wrote for CRAFT. 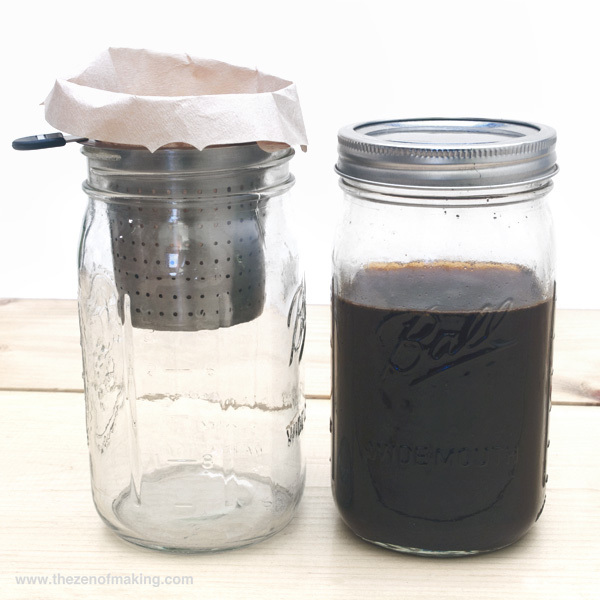 I use a coffee press for mine, and transfer to a mason jar after it’s brewed. I have a jar of regular and a jar of decaf going most days – at this time of year, the decaf is great for iced coffee before bed! Great article and exactly what I was looking for. I.E I might make a double batch, which would last for 8 drinks for me and if I’m just having 1 every morning will the 8th drink stagnate or be just as good as the first? I usually make two servings at a time (I like my coffee strong, so I don’t dilute my cold brew), and I generally drink it within 5 days. Pioneer Woman has a somewhat similar recipe. She keeps hers closed up and in the fridge for 3-4 weeks. Just a thought. I am going to try this tonite. I might make it in my French press. Hi there Haley, I have tried making Iced coffee before but I never really got it the first time, I guess the recipe and the portions wasn’t right. I will try out this time with your recipe. I find the guide clear and easy to follow.